Just right for training, plinking and target shooting. This overrun 9mm Luger Ammo from the Remington® Military / Law Enforcement Training Division is very similar to Remington's UMC® line. The one noticeable difference is the price. It costs less, making it the perfect load for economical target shooting. 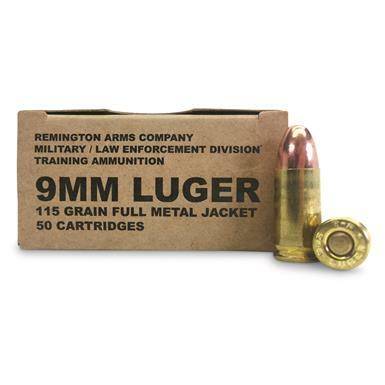 Remington Military / Law Enforcement Training Ammunition, 9mm, FMJ, 115 Grain, 50 Rounds is rated 4.3 out of 5 by 3. Rated 3 out of 5 by tommy from Good price , but will only work in my Ruger carbine. If you own a glock 19x , this ammo will NOT cycle. Stovepipe after stovepipe! I changed ammo to another brand and had no troubles! Rated 5 out of 5 by Jason from Great practice ammo Great target ammo for every day practice. No malfunctions at all and it even burns a bit cleaner than the standard Remington UMC rounds. Hit your mark with Brown Bear.